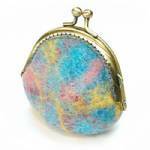 This summery coin purse is made from hand made pure wool felt in shades of turquoise, pink, and golden yellow. The metal "kiss" clasp in an antique brass finish is hand stitched to the purse body. The cream colored plain interior is unlined.